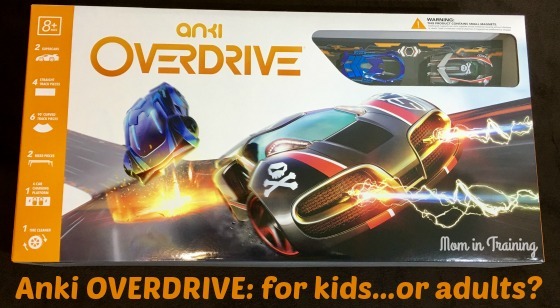 Stacy Tilton Reviews: Anki OVERDRIVE: for kids...or adults? Anki OVERDRIVE: for kids...or adults? Sometimes when you come across a great gift you have a hard time deciding who it's great for. Usually it's a choice between your kids but sometimes on that rare occasion (like this one) you can't decide if it's for your teenage son...or your husband! I think sometimes my husband is as big a kid..well as my kids. And to be honest I'm actually quite okay with that because that means he enjoys spending time with our kids doing things they enjoy too. My son being a teenager has told me numerous time's he is too old for playing with Hot Wheels and Matchbox cars, but as I recently learned not too old for "racing cars". Hmmm I didn't realize there was a difference. I guess if it involves technology it's "okay" to play with cars. Either way I had one super excited teenager when he opened the box that this Anki Overdrive set was shipped in. The first thing he asked was "Is this for me?" and "Can I open it?" There wasn't no hiding this from him till Christmas that's for sure. As a teenager I think he liked the using his cell phone aspect for racing. I think that's what made it "cool" and "okay" to play with the cars again. From a mom's aspect I really like that it's something that got him excited and he wanted to jump right in and learn all about how it worked. He's big into technology and figuring out what makes things work so this is great for him on many levels. Plus it has expansion packs and addition vehicles you can purchase so it makes choosing his birthday gift in a few months super easy for me! Buy it: You can purchase the Anki Overdrive set as well as all the extras online. There's still time for Christmas delivery so hurry on over today!